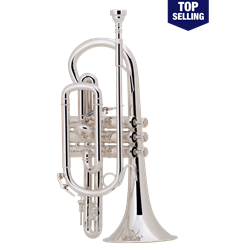 "Stradivarius" - Short (Shepherd's crook) model, .459" medium large bore, yelllow brass one-piece hand-hammered bell, Monel pistons, silver-plate finish, genuine Vincent Bach 6 cornet mouthpiece, woodshell case. TECH SPECS Bach "Stradivarius" - Short shepherd's crook design .459" medium-large bore Yellow brass one-piece hand-hammered bell Monel pistons 1st slide thumb trigger Adjustable 3rd slide rod stop Silver-plate finish Bach 6 cornet mouthpiece 1884 woodshell case Available in clear lacquer finish as model 184ML. FREE SHIPPING with your purchase!